A survey of certified ergonomics professionals was conducted in 2017 by NIOSH researchers to understand the types of basic tools, observational methods, and direct measurement methods used by ergonomics professionals. This survey served to update findings from a previous survey of Certified Professional Ergonomists (CPEs) in the United States that was reported in 2005. The 2017 survey was expanded to include ergonomists certified in Australia, Canada, New Zealand, Great Britain, and Ireland. 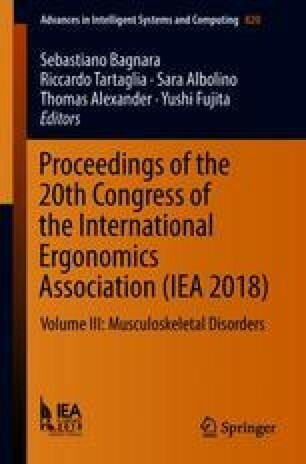 The 2005 survey content was used with the addition of technologies that were not available in 2005 (e.g., mobile devices and mobile applications) and tools likely to be of use by ergonomists outside the U.S. Overall, the participation rate was 34% (405 of 1,192 surveys that reached recipients) which was lower than the response rate of 53% for the 2005 survey. This may have been related to differences in the receipt format (postal versus internet) between the two surveys. The results for U.S. ergonomists were similar across both surveys for the most part, but there were also a number of differences. Differences across country/region were pronounced for some items, but similar for basic tools and several popular assessment tools. Overall, the results suggest that ergonomists gravitate towards inexpensive and efficient tools and methods. The strengths and limitations are discussed with suggestions for future research.